Mom and I had mixed feelings about Bella Roma. I had been there three times prior to today's visit, and Mom had been four. On our first visit, everything was spectacular. On our second visit, we were very disappointed. On Mom's trip here with Dad, she found the food to be average. On our third visit together, we found it to be nothing out of the ordinary. However, we kept hope alive in thinking that today's trip to Bella Roma would rival our first visit. It unfortunately did not. We pulled into the parking lot of the restaurant which is located in a plaza that is home to a Brooks Drug Store (soon to be Rite Aid), a Friendly's, and a liquor store. It is set back quite a bit from the street, so if you are on the look out for this restaurant from Broadway, just remember to pull into the plaza parking lot. You'll see the slim, white restaurant signs against the red roof of the building. After checking out the painted artwork on the outside wall, Mom and I went inside at around 2:30 p.m. There was only one other couple in the restaurant at this time, and once we were spotted, we were told by a nearby waitress that we could sit anywhere. After gazing at the delicious choices in the spinning dessert case, we chose a booth that was close to Bella Roma's large soup and salad bar. The waitress quickly came over to us, handed us two large plastic covered menus, and took our drink order of two Diet Cokes. When she returned with our drinks, which came in large plastic cups, Mom and I were ready to order. 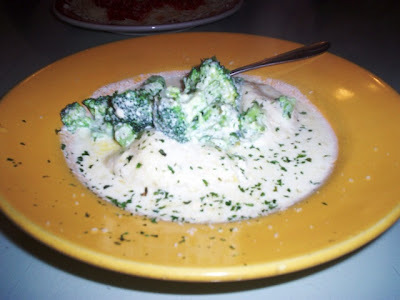 I chose the same dish that I remembered loving on my first visit - the stuffed shells with broccoli Alfredo ($11.95 for the regular size). 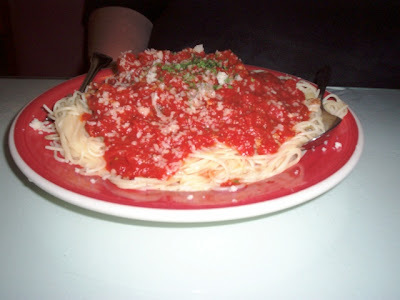 Mom ordered the pasta bolognese ($9.95 for the regular size), and she had her choice of linguine, ziti, or angel hair. She chose angel hair. The waitress informed us that both of our meals came with the soup and salad bar privilege, so of course, we took advantage. I really like this salad bar. There is a lot to choose from, everything is always well stocked, and the fruits, vegetables, and ready-made potato and pasta salads always seem to be very fresh. However, Mom did point out that the bagged salad used as their lettuce base was kind of limp on top, and she had to dig around to get some leaves underneath the pile that were crispier. The available soup was chicken noodle, but Mom and I were not in a soup mood. I like their pasta salad, but the pasta is always a bit overdone and has a a sticky texture. However, I try to make it work. With black olives and crushed tomatoes mixed into the salad, and with the chick peas that I like to throw in, the salad is quite tasty. Mom threw some French dressing onto her bed of lettuce, shredded cheese, and croutons. She said everything was very good, but the homemade croutons stole the show. They were excellent. While we were waiting for our food to arrive, I started making some notes on the interior. The beautiful artwork that is displayed on the outside of the restaurant is carried onto the walls of the interior. 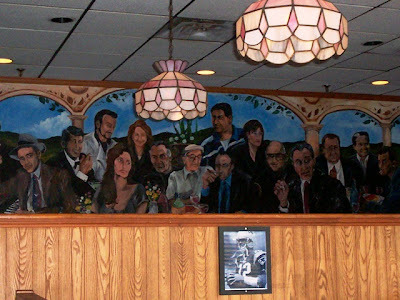 There is a huge wall-sized mural of various gangster movie and TV show characters, along with several other large murals toward the back of the restaurant that show various Italian landscapes and scenic displays. There are only booths here, but they are wide and roomy. Topped with glass, all the tables are covered in white tablecloths, which work well with the mauve booths and light wood walls. 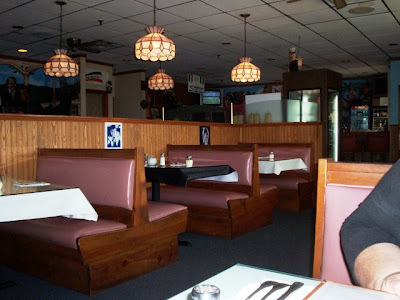 Each table has a framed black and white photo of local sports heroes or Hollywood stars from Goodfellas, The Godfather, and other movies of that genre. The chandeliers, mini blinds, and low lights give the restaurant a homey feel, but the temperature on every one of our visits has always been a bit chilly, which doesn't do anything for the temperature of the food. There is a small bar at the front of the restaurant with high chairs that are the same color as the booths, and two TV sets - one of them being a flat screen TV that was given to the owners as a gift for the restaurant's 15 year anniversary (Mom and I just happened to be at Bella Roma on that day). As for the food, Bella Roma certainly has a lot of choices. From pizza (starting at $6) to Steak Mafia ($13.95), you will definitely need a few minutes deciding what to order. Their appetizer list ranges from a basket of garlic bread for $2.75, to a hot antipasto with mussels, calamari, sausage, roasted red peppers, and stuffed mushrooms for $9.95. The children's menu is budget friendly - everything is under $6. They have several pizza selections including "an old world favorite," the Margherita Pizza (large size) for $13.95. This pizza is described as being made with the finest imported olive oil, garlic, diced tomatoes, mozzarella cheese, and seasonings. Bella Roma also has luncheon specialities, grinders (served with fries), burgers, and pasta, chicken, seafood, steak, and veal dishes. Although none of the regular size meals are over $20, Bella Roma does serve complete dinners ranging from Prime Rib Au Jus at $13.95, to the lobster and shrimp over pasta dish for $22.95. Be careful - as noted on the menu, some of these dishes are not always available, and these complete dinners are only served on Fridays and Saturdays. Each complete dinner comes with soup, salad, and the chef's choice of pudding for dessert. Bella Roma also has family size platters of the pasta dishes. They have a huge catering menu, and by the large Bella Roma truck that I usually see out in the parking lot, they seem to be very popular. They also have quite a take-out business as I always see boxed items flying out of the restaurant. They also have half (serves 6 to 8) and full (serves 15 to 18) size trays available to order for parties and other occasions. 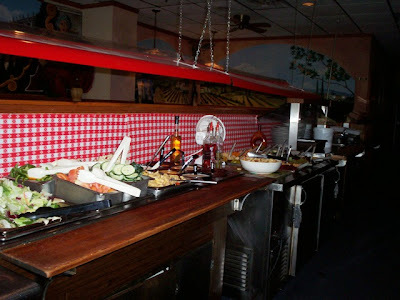 If you wish, Bella Roma can also set up a buffet for you and a minimum of 25 people. The buffet varies in cost and food choices, but the price includes the task of having the staff set up and break down the buffet, high quality disposable plates, chafing dishes, napkins, chafing fuel, and utensils. The buffet ranges from $8.45 to $15.95 per person. Our food did not take long to arrive, and perhaps that was the downfall for Mom's pasta. She said that although it wasn't terrible, the angel hair did not seem like it was left in the boiling water long enough. The pasta, just like the pasta in my salad earlier, was tacky and stuck together. Also, the temperature of her pasta was not as hot as she would have liked it. This is was actually a problem that we encountered on our second visit to Bella Roma, and although she could deal with the temperature, Mom seemed to have discovered something else she didn't like about her dish - the sauce. She said that it was nothing more than watery crushed tomatoes plopped onto her pasta with some ground meat (she wasn't sure what kind) mixed in. As I watched her eat, I noticed that she was having a hard time keeping the pasta on the fork, which was an obvious result of the watery sauce. It was unfortunate because Mom loves pasta, and I could tell that she was definitely having technical difficulties with this particular meal. My dish was good, but it was not as good as the first time I ordered it. My plate looked nearly empty compared to Mom's large serving of pasta, but luckily for me I had filled up on pasta salad, so the three stuffed shells on my plate were all that I could have eaten. The shells were a bit tacky like the rest of the overcooked pasta. The cheese inside was very good, but I noticed that some of the cheese had leaked out of the pasta and had been burned to a crisp, resulting in a very crunchy bottom on each shell. The Alfredo sauce was good, but a little watery. The broccoli was green and plentiful, but a bit on the chewy side. Also, when the waitress (who wasn't our particular server) brought over our dishes, she asked us if we would like to have bread with our meal. We said yes, and she proceeded to bring out a loaf of bread with a charred top. As Mom tried to cut into the crispy bread, and was making a sea of crumbs spread out across the table, we noticed that nicer looking loaves were being served to other tables. Again, this was very disappointing. We left $32.60 on the table for our waitress (including 20% tip) and headed for the ladies' room. The ladies' room used to be decorated with pictures of Disney characters, but Bella Roma has since updated the bathroom with very dark fuchsia and navy paint. It was a bit dramatic, but the restroom was clean and organized. You may ask why we didn't complain to our waitress about the food. The reason for this is because on our second visit, we did complain, but nothing really has improved. We were served ice cold meatballs, but we just pushed them to the side and chalked it up to the hour we visited the restaurant (it was almost closing time). We just figured that the servers were in a rush to go home, and luckily for them, we were already getting full before we decided to try the meatballs. Both Mom and I feel that the food at Bella Roma may not be cooked to order. Because of their large catering business, they may already have dishes made, and when someone places an order, the kitchen staff just heats it up. Unfortunately, the dish never seems to get heated entirely. Sometimes the middle of the dishes are cold, or in today's case, sometimes the pasta is left in the water too long. Either way, the food here really resembles that of Olive Garden, which is nothing but reheated food. 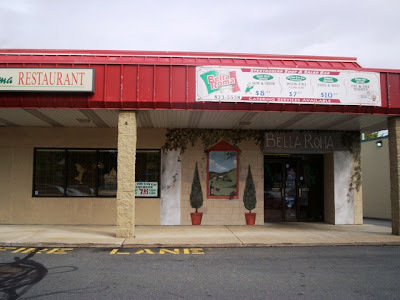 Since Mom and I have eaten at some authentic Italian restaurants, we feel that Bella Roma is really not up to par.